Moreover, São Paulo is the most populous Brazilian state. It has a population estimated at 44 million people11 and around 68,000 individuals with CL/P. From these considerations, it is clear that regionalisation and decentralisation can be very important to improve quality of health services for CL/P. However, there are very few information can be found in the literature about the political-territorial organisation of the treatment services for CL/P offered by SUS and/or free of charge in the state of São Paulo. Thereby, this study aimed to investigate the existence of regionalisation of high complexity surgeries and decentralisation of outpatient treatment services for CL/P linked to SUS and/or of philanthropic nature in the state of São Paulo, during the period between 2000 and 2015. Alveoloplasty with bone grafting in patients with craniofacial anomaly: 0404030084. Moreover, institutions not accredited by CNES as specialised centres for the treatment of CL/P were not included in comparisons regarding AIHs approved for performed surgeries, and in mappings. This study was approved by the Human Research Ethics Committee of the Federal University of São Paulo (Universidade Federal de São Paulo) (N°1481507). According to the CNES database (Table 1) there are nine centres accredited as specialised in the high complexity treatment for CL/P in the state of São Paulo, located in eight cities. 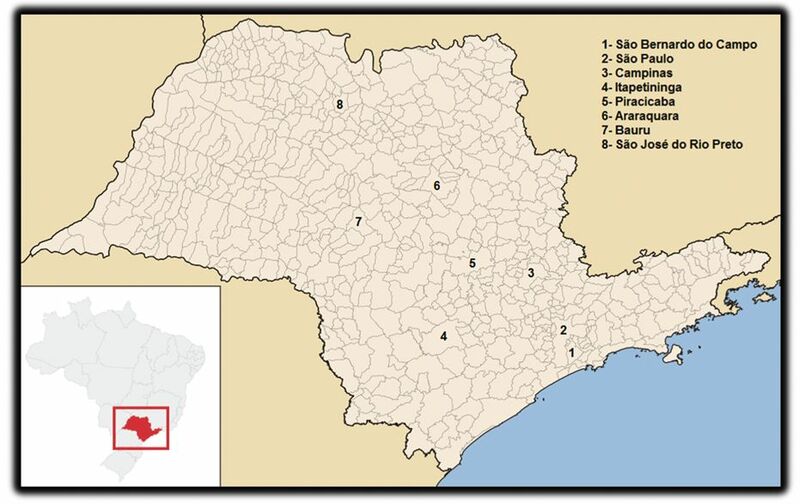 A greater concentration of these institutions was observed in cities located between and along the central region and capital, which have more than half the state's population.14 Furthermore, the absence of these services in the western, southwest, far south and coast of the state of São Paulo was also verified (Figure 1). Until the year 2000 there were only three accredited centres. From then on there has been the incorporation of six new centres. 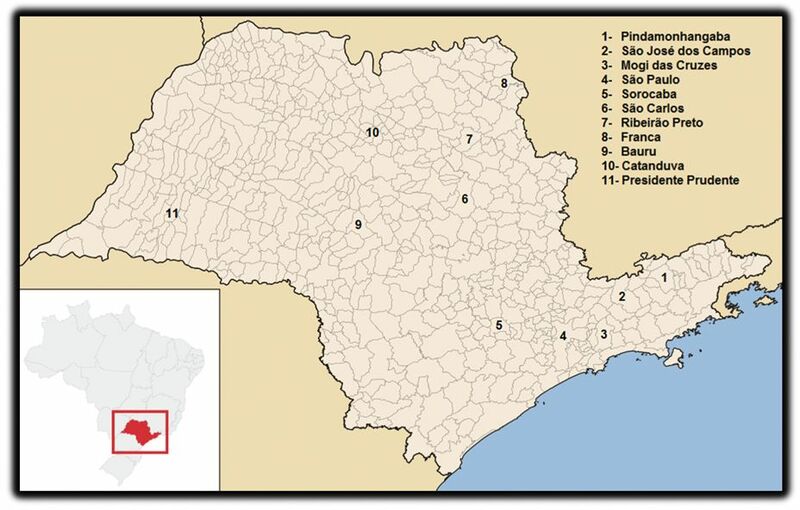 The most recent is that of São José do Rio Preto (Table 1). Figure 1 Mapping of cities with centres accredited for the treatment of CL/P in the state of São Paulo. In view of the total of AIHs approved for performing primary and secondary surgeries for rehabilitation of CL/P in accredited centres, it was verified in 2008 and 2015 a much larger number of approved AIHs to HRAC/USP, followed respectively by the Sobrapar Skull and Face Hospital (Hospital Sobrapar Crânio e Face - SOBRAPAR) and the Clinical Hospital of the Faculty of Medicine of the University of São Paulo (Hospital das Clínicas da Faculdade de Medicina da Universidade de São Paulo - HCFMUSP). The values found to other institutions were quite low, or even null (Table 2). ULTS=Unilateral Labiaplasty in two stages; TRL=Total reconstruction of lip; SL=Secondary Labiaplasty; PP=Primary Palatoplasty; SP=Secondary Palatoplasty. A higher number and better distribution of parents and friends associations compared to accredited centres was verified (Table 3; Figure 2). Over the past 15 years there has been the creation of two new associations in the state. However, there is only one nucleus directed to CL/P, located in Ribeirão Preto (Table 3). Source: PROFIS Network,13 Metamorfis,20 AFIPP,21 AAFLAP,22 Municipal Prefecture of São Carlos,23 APAFI-MC,24 ADAP,25 AFISSORE,26 PROFIS-Bauru,27 Recém Sorrindo,28 contacts by telephone. In addition, another data evaluated in this research was the number of AIHS approved for performing of high complexity surgeries for the treatment of CL/P in 2008 and 2015. In this item, HRAC/USP presented a much larger number, compared to the other accredited institutions. Also, it should be noted that, this treatment centre is located in Bauru, where there is a lower population concentration than in other regions, such as in Campinas and the state capital itself.14 Consequently, a greater centralisation of high complexity surgeries in HRAC/USP is suggested. This can be related to the fact that HRAC/USP is the largest treatment centre for craniofacial anomalies in South America and a world class reference in the treatment of CL/P. It performs all the surgical and outpatient care required for full rehabilitation of individuals with CL/P, especially in the high and medium complexity care levels. Other important characteristics are its humanistic philosophy, vast experience and the development of relevant researches in the field of CL/P.1,34 In addition, HRAC/USP serves patients from all regions of Brazil and others arising from abroad,1 so that such amount of performed surgical procedures does not reflect in the attendance only of patients from the state of São Paulo. SOBRAPAR and HCFMUSP, in turn, presented considerably smaller numbers of approved AIHs compared to HRAC/USP. However, they also acts as important centres for performing of these surgeries in the state of São Paulo. In view of the above, it should be emphasized that, there may be benefits associated when the regionalisation of surgeries for craniofacial treatment involve only centres of excellence, such as HRAC/USP.34,36 In localities as this, there is probably better surgical results, reduction of operative and postsurgical mortality, reduction of the time of stay in hospitals and greater access to provide more comprehensive care, due to the multidisciplinarity and interdisciplinarity character of the teams working for this purpose.36 This is quite relevant because work performed well does not generate further work, readmissions and so many other unnecessary procedures. In this context, associations and nuclei for the treatment of CL/P are very important, because in addition to providing knowledge of the peculiarities of CL/P and of the rehabilitation process to patients and families, many of them have their own supplementary assistance services9 in 11 cities spread in several regions of the state. However, there is not the availability of all ancillary services for primary and medium complexity care in all units, not even a broad coverage to the demand for treatment. Moreover, the state of São Paulo has one regional nucleus, which together with the associations and other institutions not accredited by CNES as specialised centres for the treatment of CL/P may contribute to the decentralisation of outpatient treatment services for CL/P in this state. Furthermore, decentralisation to health units of SUS including both the basic and the specialised assistance that are non-specific for CL/P, as is the case of the Medical Ambulatories of Specialties (Ambulatórios Médicos de Especialidades)38 and Centres of Dental Specialties (Centros de Especialidades Odontológicas)39 existing in the state of São Paulo, would be possible to be carried out, since improvements were incorporated into the reference and counter-reference system, as well as to the expansion of theoretical/practical basic training courses on additional peculiarities of these anomalies for health teams. The accredited centres can have used other procedures codes for cheiloplasty, palatoplasty and alveolar grafting performed, which were not included in this research. We therefore can not make any kind of statement about the exact total number of surgeries performed in each institution, limiting us only at inform the number of AIHs approved available on the DATASUS database for performed surgeries whose procedure codes were used in our searches. CL/P in the state of São Paulo. Figure 2 Mapping of cities with associations and nucleus for the treatment of CL/P in the state of São Paulo. Despite the creation of new specialised centres for the treatment of CL/P in the state of São Paulo, there are still indications of the occurrence of centralisation of high complexity surgeries for the treatment of CL/P, which are performed mostly by the Hospital for Rehabilitation of Craniofacial Anomalies, University of São Paulo, while for outpatient services a trend toward decentralisation was observed. The matter regarding CL/P should be incorporated in the curriculum of undergraduate health field courses. The training courses for SUS professionals need to be expanded to decentralise part of the activities of CL/P for basic health units and specialised health centres that are non-specific in this field. Thus, confirming the improvement in the quality of life of patients and their families with lower costs to them as well as the government. All words in italics are written in Portuguese. 1. Freitas JA, das Neves LT, de Almeida AL, et al. Rehabilitative treatment of cleft lip and palate: experience of the Hospital for Rehabilitation of Craniofacial Anomalies/USP (HRAC/USP)-- Part 1: overall aspects. J Appl Oral Sci 2012;20:9-15. 2. Dixon MJ, Marazita ML, Beaty TH, Murray JC. Cleft lip and palate: understanding genetic and environmental influences. Nat Rev Genet 2011;12:167-78. 3. Tovani-Palone MR, Saldias-Vargas VP. Factores genéticos y fisuras orofaciales no sindrómicas. Rev Fac Med 2016;64:381-3. 4. Crockett DJ, Goudy SL. Cleft lip and palate. Facial Plast Surg Clin N Am 2014;22:573-86. 5. Trindade IEK, Silva Filho OG. Fissuras Labiopalatinas: uma abordagem interdisciplinar. São Paulo: Livraria Santos; 2007. 6. Palone MRT, Vargas VPS. Biotecnología versus rehabilitación de las fisuras labiopalatinas en Brasil. Rev Fac Ciênc Méd Sorocaba. 2015;17:170-1. 12. de Lima LD, de Queiroz LFN, Machado CV, Viana AL. Descentralização e regionalização: dinâmica e condicionantes da implantação do Pacto pela Saúde no Brasil. Ciênc Saúde Colet 2012;17:1903-14. 13. Rede Profis. Associações/Núcleos/Subsedes. [online] [accessed 2015-12-31]. Link: http://www.redeprofis.com.br/associacoes.php. This link is currently unavailable. At present (May 2018), the links available regarding the Profis Network are: https://www.facebook.com/redeprofis/ and https://twitter.com/redeprofis. 17. Palone MRT, Silva TR, Dalben GS. A Bioengenharia tecidual em favor da reabilitação de indivíduos com fissura labiopalatina. Medicina (Ribeirão Preto) 2015;48:113-8. 32. Lorenzzoni D, Carcereri DL, Locks A. A importância do atendimento multiprofissional e interdisciplinar na reabilitação e promoção de saúde ao portador de fissura labiopalatal. Rev Odonto Ciênc (Online) 2010;25:198-203. 34. Santos CF, Garlet GP. The experience and excellence of the Hospital for Rehabilitation of Craniofacial Anomalies, University of São Paulo (HRAC/USP), in the rehabilitative treatment of cleft lip and palate. J Appl Oral Sci 2013;21:496. 36. Allareddy V. Is there an increasing regionalization of surgical repair of craniosynostosis procedures into teaching hospitals? Implications of regionalization. Cleft Palate Craniofac J 2016;53:197-202. 38. Tadei VC, Braile DM. AME: Ambulatório Médico de Especialidades-agilidade com resolutividade. Rev Bras Cir Cardiovasc 2008;23:570-1. 39. Rodrigues LA. Avaliação do fluxo de referência para um centro de especialidades odontológicas implantado em cidade de médio porte na região Sudeste.Cad Saúde Colet 2013;21:40-5.